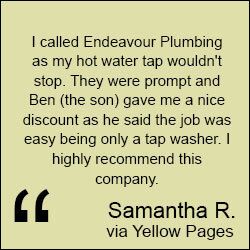 Over the years, Endeavor Plumbing has remained one of the most reputable plumbing companies servicing South Yarra. While plumbing systems are utilised daily by all of us, people often forget how inconvenient it is to find that their system has suddenly stopped working properly. In instances such as this one, our team is equipped with the expertise and the tools to take care of all plumbing necessities. We have worked with customers of all trades, making us versatile and knowledgeable with various kinds of systems; whether it is an office, commercial space, home, or any other facility, we are able to adapt and apply the proper techniques according to the job setting. Installation of hot water systems, drains, pipes, and rainwater tanks. Happy and satisfied customers are our main focus. We strive to hold a high level of customer service, making sure that all of our client’s conditions and demands are looked after properly. As aforementioned, a fully functioning plumbing system is a daily necessity, thus, we aim to be the company that you rely on wholeheartedly to take care of whatever labour is required. Along with being reliable, the professionalism showcased by our company under any circumstance is unconditional. We treat each and every single client with respect, assuring that all of their inquiries are answered, and that they are informed every step of the way. The rates offered by us will always be kept as affordable as possible and in line with the demands of the task at hand. We will always work transparently with you to ensure that you are receiving the best value. If you are in need of plumbing services in South Yarra, contact Endeavor plumbing through our website’s contact page or via phone. Our team is available 24 hours a day, 7 days a week, allowing us to treat your request with the urgency that it deserves. If you live in the South Yarra area and require plumbing services, contact us through our Contact page, or via telephone. We will respond to your requests as soon as we can. The map below shows the service areas Endeavour plumbing offers in South Yarra, Victoria. For emergency plumbing services in the below service area in South Yarra, call us. We also provide plumbing services in Metro and surrounding suburbs such as our plumbing services in Canterbury, if you're looking for the quickest service speak to our expert plumbers today.